I am starting this review with two caveats. First, this book is engagingly written, and Joshua Wolf Shenk has done his research. In spite of this, I don't think it's a good first book for anyone to read on Lincoln, because much of Shenk's focus is on revisionist history. Although he does a laudable job providing brief overviews of some of the historiography on Lincoln, many readers will get more from this if they have a more detailed understanding of major events in Lincoln's life. Second, as a medieval historian who gravitates to social and cultural history, I have profound concerns about psychological interpretations of the past. As a graduate student, I was influenced by [a:Thomas S. Kuhn|4735497|Thomas S. Kuhn|http://d.gr-assets.com/authors/1341864336p2/4735497.jpg]'s study of the role of paradigms in science, and as someone who teaches history of sexuality I can point to many examples of how medical professionals, psychiatrists, psychologists, psychoanalysts, and scientists have constructed understandings of normality versus abnormality via frameworks that stem from the societies in which these scientists were trained and lived. I'm not suggesting that there is no physical or biological "truth" independent of culture; however, I am arguing that cultural norms play an influential role in how people construct paradigms to explain the world around them, and that these paradigms are not restricted to myths and legends, but extend to other areas of life, including not only religion but also science. I have particular concerns about applications of Freudian theory to other societies -- for example, Erik Erikson's [b:Young Man Luther: A Study in Psychoanalysis and History|307553|Young Man Luther A Study in Psychoanalysis and History|Erik H. Erikson|http://d.gr-assets.com/books/1361744502s/307553.jpg|298524], in which Erikson applies psychoanalytic theory to understanding Martin Luther's life, made me alternatively laugh and grind my teeth. 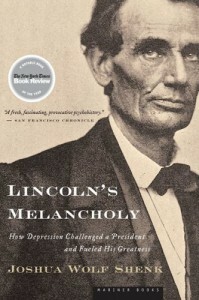 Because of these concerns, I was happy to read Shenk's very clear statements in Lincoln's Melancholy: How Depression Challenged a President and Fueled his Greatness that he was not interested in applying modern views of depression and mental health wholesale to his analysis of Lincoln's sadness. I agree with the importance of his project, to expand studies of Lincoln into a his ideas, thoughts, emotions, contextualizing all these elements in Lincoln's culture. The three stars I have given to this book show that, in my opinion, Shenk achieved this goal in part, but not completely. Shenk divides the book into three sections. In the first, he explores Lincoln's childhood, family background, and young adulthood, while also providing a basic framework to understand how his life exemplifies certain aspects of depression. In this discussion, he moves back and forth between modern definitions, and contemporary understandings of melancholy and hypochondriasis, delving both into literature on the history of medicine and primary sources written by Lincoln and his friends and associates. Shenk also revisits historiographic controversy over Lincoln's relationship with Ann Rutledge, whose death occurred at the time of Lincoln's first major breakdown in 1835. Shenk carefully sifts through existing sources, and provides a cautious revisionist interpretation of what Rutledge may have meant to Lincoln. Shenk concludes this section with a lengthy discussion of events in Lincoln's life leading up to his second major breakdown in 1840-1841. 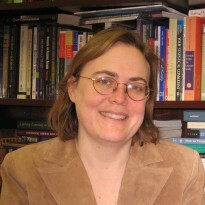 Once again, Shenk questions some historians' assumption that a temporary parting with Mary Todd led to the breakdown, instead discussing the vague nature of evidence, recreating timelines, and expanding his consideration of stresses in Lincoln's life beyond the romantic to Lincoln's political career. He spends much time discussing Lincoln's close friendship with Joshua Speed, drawing some parallels between their experiences and using Speed as a source on Lincoln's life in this period. Throughout this section, Shenk argues that Lincoln's emotions fit patterns for melancholy in his time, and, to some extent, depression in our time. I found particularly interesting Shenk's discussion of treatments of hypochondriasis and melancholy in Lincoln's time, and wish he had continued to focus on this context through, rather than relying as much as he did on ore current thinking about depression. 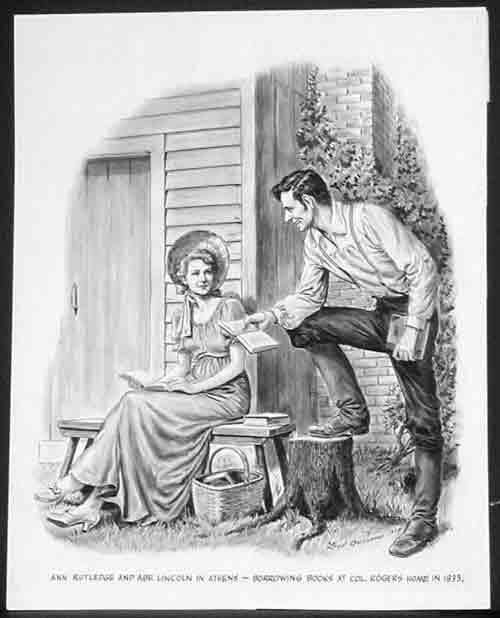 Ann Rutledge and Abraham Lincoln -- truth or myth? In the second section of the book, Shenk shifts his focus to Lincoln's determination in the face of his melancholy. He bore certain pressures as a self-made man, a new role that put Lincoln particularly at risk to be intensely self-critical and pessimistic, as he bore the responsibility for his achievements. Shenk also explores some of the intellectual currents of Lincoln's time that fueled his intense self-examination. Throughout this discussion, Shenk provides some context to understand Lincoln's fatalism and sense of destiny, not only through cultural context, but also through an analysis of Lincoln's writings. "From the perspective of modern clinicians, the persistence and quality of Lincoln's symptoms call for a new diagnostic framework. Major depressive disorder, which applies to Lincoln's earlier years, best describes a series of discrete episodes, even if they go on for many months at a time. But when a condition lasts for more than two years, even with some breaks in symptoms, it is considered to be a chronic depression. Episodic and chronic depressions have much in common, but the distinction matters. Imagine a person who begins to travel abroad as a tourist. The first few trips are memorable—when they started, how long they lasted. But if the trips grow in frequency and duration, at some point the tourist would become known as an expatriate. The destination need not have changed, but the nature of the journey would call for a qualitative, not just a quantitative, distinction. "As it turns out, the "land" of chronic depression is one for which few guidebooks have been written. The psychologist James P. McCullough, Jr., one authority on the condition, describes it as "grossly misdiagnosed, understudied, and undertreated." This poses both a challenge and an opportunity in the study of Lincoln. The existing literature can't definitively contextualize his experience. But his life, supplemented with the shards of knowledge on chronic depression, can offer a new and valuable context. In particular, it shows how depression, for good and for ill, can blend slowly, subtly, but surely with a person as he works to bring himself into balance." I think that Shenk's approach, looking to Lincoln's life to lend perspective to depression, and looking to research on depression to understand Lincoln's life, leads him to rely too much on this modern perspective and research, especially in the second and third parts of the biography. He did not have to take this approach -- in places, he discusses the 19th-century view that melancholy led not only to suffering, but also to gifts for the sufferer. And this argument constitutes Shenk's main thesis, which he explores in detail throughout his third section -- that Lincoln responded to his melancholy and breakdowns by deciding, at a certain point, that he had to continue on to fulfill a destiny much greater than he was, one that grew over time to be tied to the realization of the Founders' view for this country as a place of freedom. Lincoln recognized the gaps between this ideal and the reality of the Founders' views as implemented, but he viewed American history as unfolding and leading towards progress. According to Shenk, over time Lincoln saw the abolition of slavery as a means to help achieve this goal. In addition, Lincoln's fatalism provided him with strengths during his Presidency, as he did not tend to be over optimistic in his assessment of the Union's progress in the Civil War. As a whole, I did like this book. It's thoughtful, well-researched, and engaging. Shenk also provides some useful statements about the dangers of relying on modern definitions of depression to understand Lincoln. His analysis of Lincoln's breakdowns after Ann Rutledge died in 1835 and in 1840-1841 provide some excellent examples of historical analysis of vague primary sources. And many of Shenk's analysis of Lincoln are engaging, as in his chapter exploring Lincoln's coping strategies, including humor. In the end, though, I found Shenk to be overly-reliant on these models and research. I wish he had devoted some more time to expanding on some of the fascinating contextual information he provides, as I think he's at his best when focusing on Lincoln's time period. I also wish he had been more consistent in his analysis in differentiating between contemporary reflections on Lincoln (in letters and writings from the time), and retrospective reflections by Lincoln's associates and friends. As a whole, though, this is a biography that provides a different emphasis to undertand Lincoln, as well as some new topics and themes to explore in studying the emotional and intellectual world of Lincoln and his contemporaries.